Spectacular views from the temple. 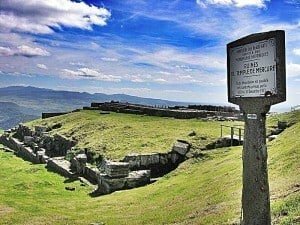 Near the summit of a well known volcanic mountain in south-central France, the Puy de Dôme, are the impressive remains of a Roman temple, which at 3 600 m² was one of the largest religious sanctuaries in the western Roman Empire. Given the discovery of a bronze plaque bearing a dedication to the Roman god Mercury, it is generally accepted the temple was dedicated to Mercury, hence the name. Also, a small statue of Mercury was found here. The temple was discovered in 1873, and has been repeatedly and extensively excavated, first in the 1870s and more recently between 2000 and 2004. The visible remains are those of a large temple built during the second quarter of the second century AD, around 140 AD. Like many temples built during the Gallo-Roman period, it has both Classical features as well as elements typical of Gallo-Roman Temples. Recent excavations have revealed the foundations of an older temple to the north of the younger temple. 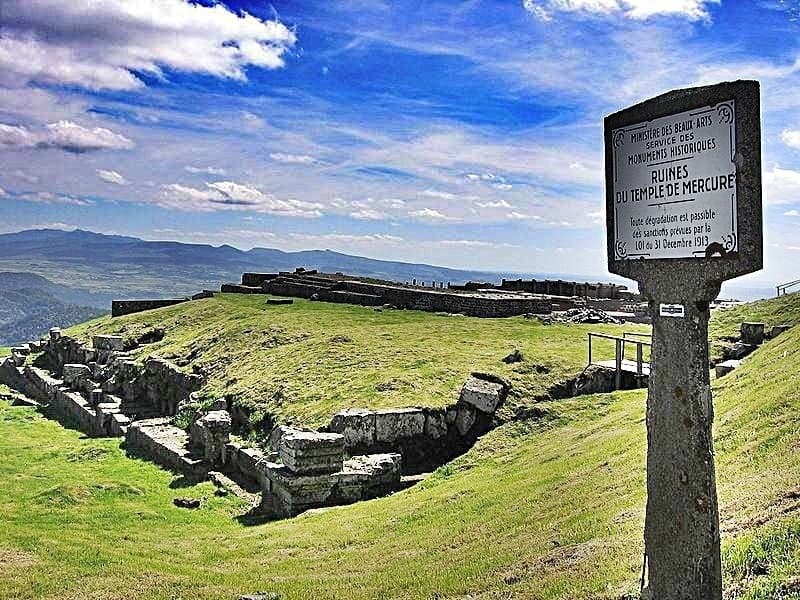 This temple would have been seen from the nearby, large Roman town of Augustonemetum, modern-day Clermont-Ferrand. The town was situated on the Via Agrippa, a Roman road that ran between Lyon and Saintes. And, it is a Roman road that is still used today to ascend the volcano on foot. Mercury was the god of travellers, which may explain why he was placed in this particular temple next to a major Roman road. Besides the elevated archaeology, the summit offers expansive views of the Chaîne des Puys – a 40 km chain of volcanic cinder cones, lava domes and maars. The Puy de Dôme, roughly at the centre of this chain and the highest point along it, is one of the youngest volcanoes in this group that is thought to have last erupted around 5,760 BC. The Puy de Dôme is one of the most popular attractions in the Auvergne region of France. Audio-guides are available in French, English, Spanish and German, as well as for visually impaired visitors. The temple is located at the summit of a volcano – there are two ways to reach the temple. What was a Roman road is still used to ascend the summit by foot. There is also a 6 km/4 mile road for cars that has a gradient of 12%. During peak summer season, and other holidays, private cars must be parked at the bottom and the ascent must be made by bus. During peak holiday season you are also able to catch the bus to the summit of Puy de Dôme from the Clermont-Ferrand railway station (approximately 10 kms). Where is Puy de Dôme? The temple is located on the summit of a large lava dome, the Puy de Dôme, 1,464 m (4,803 ft) high.